An Eye Shadow Quad in four shades: Caramel Sundae, Cheryl Chic, Dreammaker and Showstopper. The highly pigmented powder formula applies evenly, blends and builds beautifully. Limited-edition Archie's Girls packaging. Showstopper applied all over lid (over Cheryl Chic as a base). Dreammaker applied just on the center of the lid. Caramel Sundae to blend out the edges along the crease. 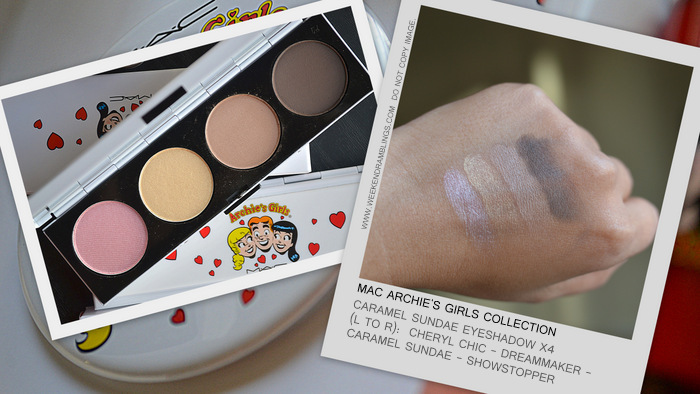 MAC Caramel Sundae eyeshadow quad is part of Betty's line from the MAC Archie's Girls Makeup Collection. I amn't a fan of MAC's prepackaged palettes, but I really couldn't resist the limited edition packaging in this collection, and that's how I ended up with this palette! I didn't have very high expectations from this quad even when I bought it, and perhaps because of that, I am not terribly disappointed with it either. I love the packaging - which is the main reason why I bought it - but I also like the mix of finishes that MAC has incorporated into this palette. I am sure there are much better eyeshadows in the MAC permanent range, but these aren't all that very bad. The Caramel Sundae eyeshadow quad is a nice palette for anyone with a love for neutral/browns, and the eyeshadows do pack a reasonable amount of pigment in them. Here's a look at the swatches. Wearing Cheryl Chic all over my lid and Showstopper on the crease. Used Caramel Sundae to blend out the edges. All from the MAC Caramel Sundae Eyeshadow Quad - MAC Archie's Girls Makeup Collection. While I won't go so far as to say this is a must-have, either as a MAC product or as part of the MAC Archie's Girls Makeup Collection, I do think it's a nice palette. You might want to give it a try if (a) you like the packaging and are willing to surf through YouTube videos on how to dismantle and use it as your custom palette and/or (b) like the idea of a wearable/neutral/brown palette in a cool limited edition packaging :P :P I like that the palette can be used to do subtle daytime looks just as easily as a darker smokey eye, and the colors seem like they would suit any skin tone. I did not have any creasing/smudging/fading issues, and I could even skip a primer especially when I layered the shadows to build up the intensity (though won't recommend that in warmer weather). The one fault I do find with this palette - the shadows need a bit of work with blending, at least for someone with next-to-nothing blending skills like mine, but I have seen a lot of photos online of awesome makeup using this quad, so I do think it's something that can be sorted out with a bit of patience. Not excited about this palette. I like the colours of the Veronica one more. I jus dropped by at MAC n they said Archies collection not expected for another month!!! A MONTH!!! Oh well, I'll just buy whatever I want whn I'm travelling during vacations.